The project is implemented jointly in partnership with ”Ovidius” University of Constanta, Chamber of Commerce and Industry – Dobrich and ”The Institute for the Promotion of Tourism and Applied Economy” Association Constanta. 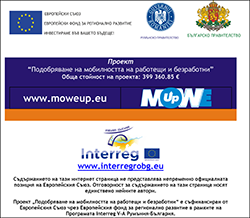 The project is funded under the Cross-Border Cooperation Program INTERREG V-A Romania-Bulgaria through the European Regional Development Fund. The main objective of the project is to reinforce labor market integration in the Dobrich-Constanta cross-border region by creating sustainable conditions for labor mobility, increasing employment of target groups and stimulating entrepreneurship by using existing local resources.